Though understated in character, this faux-marble sidewall required an impressive amount of attention to detail on behalf of the manufacturers. The larger background patterns are block-printed in subtle tones of light grey, blue and pink, and the top layer of whitish veins is painstakingly hand painted. Kept for reference in the archives of American wallpaper manufacturers Jones & Erwin, Inc. in the early twentieth century, today the paper remains in nearly mint condition. The excellent preservation speaks more to quality production than age, for it’s possible this paper may be nearly two hundred years old. Faux-marble papers were incredibly popular in France, England and the United States (or British colonies, depending on the year) for most of the eighteenth and nineteenth centuries. Often used in hallways and entrances, faux-marble gave a grand appearance to more modest dwellings. We know this particular sidewall was not made before the 1830s, because it is printed on a continuous machine-made paper, but the hand painted detailing suggests a pre-twentieth century date. Whenever it was made, production quality of both the paper and the printed design is high, indicating that this sidewall was top of the line in its day. The illusion of marble is so effective that close scrutiny is necessary to determine that it is in fact wallpaper and not stone. Printed, faux-marble papers are often confused with marbled wallpapers, which were fashionable at the same time. 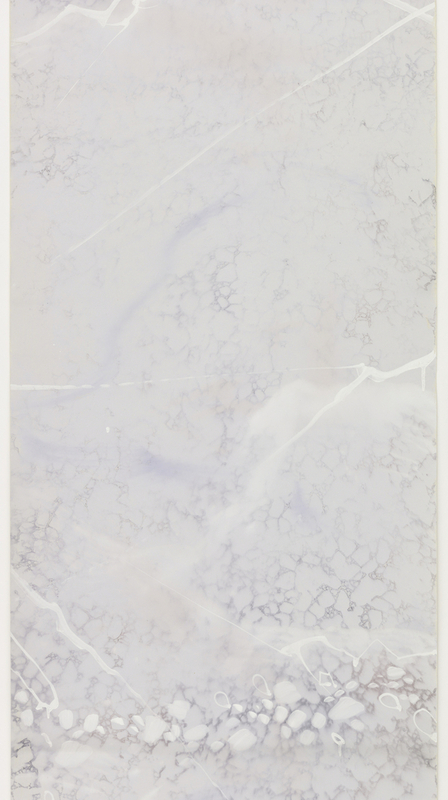 Marbled papers (or “Turkish papers”, as they were called when they first made their way to Europe in the sixteenth century), were made by floating oil-based paints in liquid, and then lifting the pattern onto a piece of paper applied to the liquid’s surface. The patterns on marbled papers are somewhat random, and though reminiscent of natural marble are not meant to exactly emulate it. In this lovely faux marble paper, however, each swirl and vein was consciously chosen and precisely placed, a careful copy of nature’s art. Anna Rasche is a student in the History of Decorative Arts & Design graduate Program at the Cooper Hewitt, and is a Master’s Fellow in the Wallcoverings Department. Sidewall, 1900–25. block-printed and handpainted on continuous paper. Gift of Jones and Erwin, Inc.. 1970-26-5-a/c.